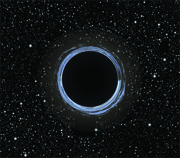 In the movie Interstellar, the hopes of humanity swirl around the event horizon of a giant black hole named Gargantua, which warps time, space and starlight. Through the wormhole at its center, a team of scientists is instantly transported to a solar system 100 billion light years from Earth, where the gravitational effects of the black hole distort time itself. Brian Greene is a professor of physics and mathematics at Columbia University, and is recognized for a number of groundbreaking discoveries in his field of superstring theory. His New York Times bestselling books include The Hidden Reality, The Fabric of the Cosmos and The Elegant Universe, a finalist for the Pulitzer Prize and the inspiration for the companion Emmy and Peabody award-winning NOVA series The Elegant Universe. Because so much of Interstellar involves a giant black hole named Gargantua, which has a mass of 100 million times the Sun, can we start with a little black hole 101? A black hole is a region of space where a sufficient amount of mass -- matter that has been crushed to a sufficiently small size to create a sufficiently powerful gravitational field that if anything gets too close -- including light itself -- it won't be able to escape. And it's an idea that actually dates back to the late-1700s when a fellow named John Michell was thinking about the motion of light near a body like a planet or a star but it really took off with Einstein's general theory of relativity in the early part of the 20th century when the equation, in the hands of a guy named Karl Schwarzschild, gave rise to this possibility of a dark region -- a region that would be a gravitational abyss. A black hole doesn't actually have any matter, does it? That's sort of a tricky question to answer. So oftentimes we envision black holes being created when a star -- a massive star -- exhausts its nuclear fuel, which it uses to support its own weight -- its own mass. We know that the star implodes, it collapses in on itself: so there is mass, if you will, but we believe that that mass gets crushed into an infinitesimally small region that we call the singularity and then we don't really know what happens to it there. And it's perhaps worth saying that a singularity is physicists' way of saying, "We don't know what the heck we're talking about" -- the equations break down. So is there a little tiny nugget in there? Is it a little puncture in the fabric of space? We don't know where the mass goes -- it's as if the mass is going down this incredible rotorooter-type trash compactor and where it ends up we're not sure. Please correct me if I butcher this -- is it true that Einstein's relativistic physics predict a singularity but Einstein can't predict what actually happens inside a singularity: we need quantum physics for that? That's a fine description. The only thing that I find a little bit funny about it -- and many physicists would say it just as you did -- when we say that Einstein's theory predicts a singularity that makes a singularity sound like a thing that makes sense. But the reality is that Einstein's mathematics simply go haywire and that's the sign of something going drastically wrong, and we don't know exactly what goes wrong so we label it singularity. It's not like it's this well-defined thing that you come out of the equation -- basically the equation makes no sense when you go right down to the central location of a black hole. And you're right, if we had quantum physics we think that that might shed light on the badly behaved math, but we're not even sure about that. So the singularity -- it's not a thing; it's kind of a placeholder for where the math goes wrong. All this time I have been thinking this thing called the "singularity" was a point of infinite mass in an infinitely small space, but that's not right? Right. Infinite mass doesn't make any sense, infinitely small space doesn't really make any sense either; so all of he words that we use to describe the singularity are words of confusion. So what's really happening is what you described at first: the mass is yielding these crazy notions of infinite density, infinitely small spaces, and we look at that and we're like, "Oh man, that doesn't make any sense, so let's call it a singularity so we have at least a name for this thing that doesn't make any sense." Our suspicion is that if we could properly inject quantum physics into the discussion that we'd no longer need to talk about infinite density or infinite mass or infinitely small spaces. We believe that the new insights from the quantum mathematics would prevent us from ever having to talk about those confusing nonsensical motions: that's the dream. So it's believed that giant black holes live at the center of most big galaxies. Is that right? Yeah, it seems to be the case that many, many galaxies have at their center -- sort of if -- so as if the center of the black hole powers the galaxy in a sense. But the mass of these black holes is way too big to have been formed by a single star, right? That's right. So you can envision that these guys can gobble up stars over time and get larger and larger, but the actual origin of the center black holes is still somewhat mysterious. Can we talk about the holographic principle? What happens when things fall into black holes? The holographic principle emerged from the careful mathematical study of black holes where it was found -- there was evidence found that if you drop an object into a black hole the information that it carries is not gobbled up by the black hole itself, but rather there is mathematical evidence that the information that the object carries -- think of it as an iPad you throw into a black hole: the iPad has all this information on it; that information is not gobbled up by the black hole but instead it's smeared out on the surface of the black hole -- smeared out on what we call the event horizon -- and it's a long story and it's not an obvious one that yields this strange picture, but once you have this strange picture you realize it's sort of like a hologram because you've got information on the thin surface that is equivalent to the information carried by a 3-dimensional real object that fell into the black hole. It's like a hologram: it's just a thin piece of plastic that can illuminate what looks like a real 3-dimensional image. And once people had that idea they said, "Oh wow, we can even imagine generalizing this in space, inside a black hole, it's really not fundamentally different from space outside the black hole. So let's imagine that even our environment is surrounded by a thin surface that bounds us at the edge of the observable universe." And there's information on that surface which is equivalent to the information required to describe the comings and goings of everyday life. Which would mean that you and I and all of the 3-D material objects in the world around us would be in essence a holographic projection of that information that lives on this giant sphere that surrounds us at the edge of the observable universe: so we would be the holographic projection. What is the black hole or universe equivalent of binary? Oftentimes when people talk about the holographic principle and they talk about information being stored on the surface of a black hole it's often described in a binary language where -- that the surface area of the horizon of the black hole is partitioned up into little tiny squares, each of which is a Planck-length on each side -- which is sort of a shortest length that seems to make sense when you put gravity and quantum mechanics together. So imagine you've got this kind of checkerboard pattern on the surface of a black hole where each of those little squares can hold onto a zero or a one: a binary vision. So when you throw your iPad in some sense into the black hole the information in your iPad shows up as kind of zeros and ones in this grid-like pattern of a horizon of a black hole. That is all very symbolic -- I'm not literally saying they're zeros and ones on the horizon itself but you get the feel for how it is that the black hole stores information. And the reason why we talk about it in this language is when you do the math you find that the number of binary digits -- the number of bits that a black hole can store is equal to its area divided up into these little plank-length squares. Can we talk about wormholes? A wormhole is a kind of tunnel from one location in space to another that, in principle, allows you to go from the first location to the second much more quickly than if you had to travel the long way all through the distance in the outside realm itself. And are these taking you to other places in space or is it other places in time or both since space and time are all kind of woven together? The whole thing is -- and before I talk about them, I'm sure you already know we're talking total hypothetical stuff here. Mathematics allows for these things -- no one's ever seen one, there's no evidence or anything -- so that's just a caveat. But the wonderful thing is that the math shows quite directly that if you have a tunnel from one location in space to another location in space, then with the most modest of strategies you can transform that into a tunnel that goes from one moment in time to another moment in time. All you need to do is move the openings of the tunnel relative to each other or take one of the openings and bring it near a black hole for instance -- any of these maneuvers will cause time in one opening of the wormhole to elapse at a different rate than time at the other opening of the wormhole and they become out of sync. And once the openings of the wormhole are out of sync that means if you go through one opening, when you emerge through the other you emerge not only in a different place but also a different time. I understand that one potential issue -- and I guess there are a variety of issues -- but one issue of traveling through a wormhole is that it's not necessarily traverse-able -- it might collapse? Yeah. The earliest mathematical incarnation of a wormhole showed quite directly that it would be unstable: that it would pinch off in the manner that you're describing. And then other physicists came along -- and here's where Kip Thorne and his students played a vital role -- they noticed that if you thread the wormhole with a certain kind of exotic material that gives rise to a kind of antigravity force it can prop the wormhole opening so that it wouldn't collapse. It would stabilize it. Is it conceivable that it might be possible to create an artificial wormhole -- a naked singularity and keep that propped open in order to move through it? Yeah, so first off you wouldn't have to necessarily have a naked singularity for a traversable wormhole, but yes you can conceive of many things -- we can conceive that the moon is made of cheese -- but you know the mathematics at least allow you to envision that you might artificially create a wormhole. The typical ways that people have thought about it is if you make use of the speculation of quantum physics and in the micro realm the fabric of space is threaded by little ultra-microscopic wormholes you might be able to reach down into the micro world and pull a wormhole out and stretch it -- enlarge it -- and in that way maybe artificially create a big one that you might be able to go through. Yeah, that's right. So one of the outcomes of the early investigations into how general relativity and quantum mechanics might talk to each other is the notion of quantum foam, which is at the fabric of space on a very tiny scale and is very different from the realms that we inhabit up here in the macro world. It's tumultuous, it's a realm where pieces are ripping apart and coming back together. It's a realm where these little tunnels are just popping into existence and then disappearing. The principle -- if you could reach down there and grab one of these ephemeral microscopic wormholes and somehow with a pair of tweezers kind of stretch it and make it bigger you might in that way be able to have a large one. Well, first I would say that travel to the future is real in the sense of it's within established physics, it's just hard to achieve. So if you want to see what the world will be like in a million years from now I can tell you exactly what you need in principle to do to achieve that: carrying it out is the stumbling block. But the big question is: can you ever travel back in time? And indeed that's where this notion of wormholes has had its most interesting application -- or at least in theory, because were you to do what we described earlier -- which is set up a wormhole and manipulate the opening -- the mouths of the wormhole -- so that they come out of sync: then passing through the wormhole in one direction would take you to the future, but passing through the reverse direction would take you to the past. So we don't know if wormholes exist. If they exist, we don't know if they would be traverse-able. We don't know a whole lot of things; but if you had one of these objects then, at least, the math suggests you can go forward or backward in time. I've saved an easy question for last: what is time anyway? Well, that's one of those very difficult questions. You know there's a wonderful quote that John Wheeler got off of the men's room in some café in Austin, Texas, which basically said, "Time is nature's way of ensuring that everything doesn't happen all at once." So it's not a bad way of thinking about what time is. But most of us think of time as the arbiter of change. Time is what allows change to happen. And we notice that time has elapsed by seeing change: that things are different from where they were in the past and that very notion is a comparison between two situations, and that change is the evidence that time has elapsed. So most of us think of it in that way: if change can happen then time is the substrate along which that change occurred.